At Pro-Line, roof maintenance is one of our specialties. Of roof maintenance experts thoroughly inspect and maintain the quality your roof and its shingles to prevent leakage of any kind into the interior of your home. Ignoring small repairs can lead to big repairs. To schedule an expert roof inspection, call us today at 708-479-1237. February and March are particularly bad month for one of the most important structural components of our homes. The weight of snow alone that falls in these months is enough to cause structural problems or even pull gutters from their brackets. On top of that, in the Chicago area, we are known to have multiple freezing and thawing patterns towards the end of Winter. The expanding and contracting of ice made by freezing and thawing can cause gutter problems or extensive roof damage leaving portions of your roof in a state of disrepair. When damage is cause by wind, rain, hail, snow Pro-Line Contractors is here to help. Usually Winter-ice-damage isn’t noticed until the first few thaws of spring when moist paint and plaster is noticed in ceiling from water from thawed ice and snow creeping its way into the eaves or between shingles of your roof and into your home. We recommend getting your roof inspected twice per year to prevent damage like this from being caused. It is not uncommon to see damages caused by wind and hail in our area as well. Hail can cause cracks and dents in skylights and gutters and damage shingles. You roof should be inspected after any major hailstorm, as some severe damage can go undetected. If your roof issues are too much too restore or repair a complete roof replacement is a possibility. Replacing a 20 ft square area of roof can sometimes be just as costly as replacing the whole roof. 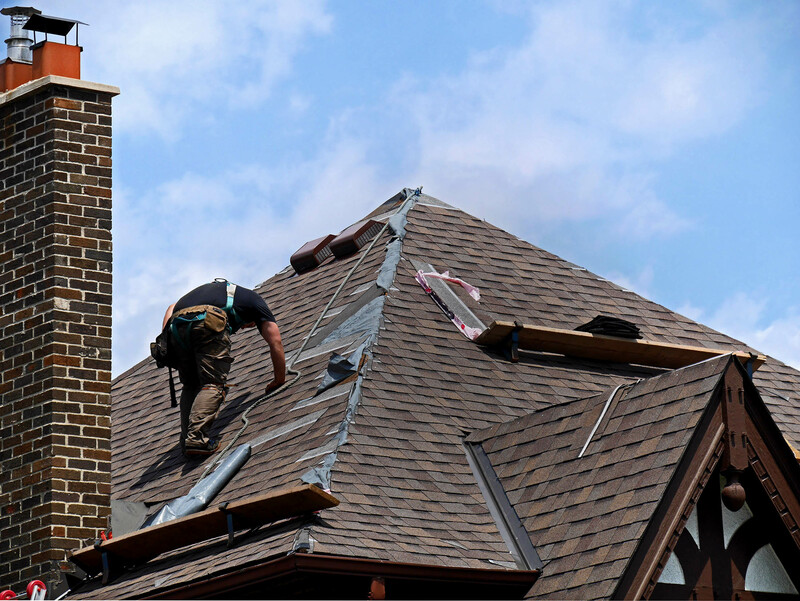 When we replace a roof, every shingle is expertly installed by experienced, insured professionals. We meet your needs and budget and handle your shingles, vents, gutters, flashing, and chimney. Contact us on our website or call us today for a free estimate 708-479-1237.